Congress spokesperson Pawan Khera says they (the ruling party BJP) cannot hide behind the veil of national security. Defence Minister Nirmala Sitharaman gave an extensive response in the Lok Sabha on Friday. 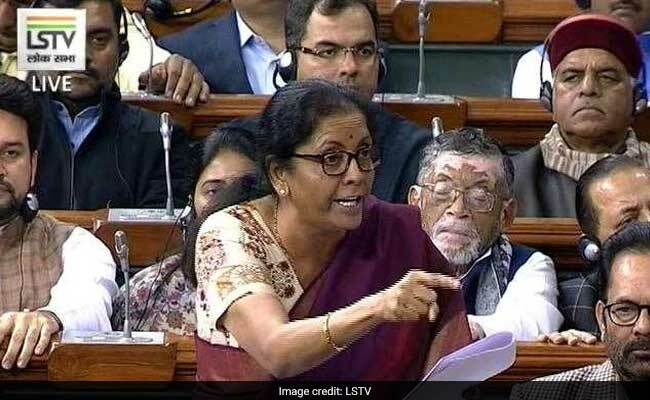 The Congress today accused Defence Minister Nirmala Sitharaman and her senior colleagues of spinning a "web of lies" around the Rafale deal issue to hide the prime minister's "falsehood". A day after the government's defence in the Lok Sabha over the Rafale deal, Congress spokesperson Pawan Khera said: "The ministers in the court of this 'king' are lying, to hide the falsehood of the 'king'. The defence minister said lies. It is not her fault.. her fault is that she's a minister in a court of a 'king', who has uttered such a huge lie. And to hide that lie, the entire cabinet is lying." "And, lying inside Parliament, can there be a bigger crime than that," Mr Khera said. The Congress has been targeting Prime Minister Narendra Modi on the deal alleging that the price of each aircraft was sharply hiked from around Rs 526 crore, negotiated during the UPA rule, to Rs 1,600 crore and that the contract will help Anil Ambani get Rs 30,000 crore through offset contract. Rejecting the charges of corruption, Ms Sitharaman on Friday said: "Defence Ministry has been functioning without dalals (middlemen) during five years of (Prime Minister Narendra) Modi. Rafale is a decision in national interest." Mr Khera said PM Modi had bowed before entering the Parliament, as if he was entering a temple. "And there, he and his ministers say lies," he alleged. "The first lie she said was that HAL and Dassault have no contract. On March 13, 2014 a workshare agreement was signed, was she not aware of this? She is a well-read person, so cannot say she was not aware of it. I cannot accept it. It is an attempt to add another layer of falsehood to his (Modi''s) lie," Mr Khera alleged. The Congress spokesperson, during a press conference, also flashed old media reports on the visit of French defence minister in October 2017, to buttress his claim that Ms Sitharaman was "lying about not knowing the offset partner of Dassault (the maker of Rafale aircraft)". "In October 2017, French Defence Minster came to India, paid floral tribute to Amar Jawan Jyoti, and then held bilateral consultation with her Indian counterpart. She then visited Nagpur, where she participated in the foundation stone-laying ceremony of Dassault Reliance Aerospace Limited, the joint venture project. The Maharashtra chief minister was present, and other BJP ministers were there too," Mr Khera said. "If they had dealt with Rafale issue in a straight forward manner... but, don't know if they would be be able to extricate themselves out of this web, they have spun around them," he claimed. "The number of aircraft was reduced from 126 to 36, HAL was kicked out and Anil Ambani's firm was brought in," he alleged, and claimed, "they cannot hide behind the veil of national security".